We study credit allocation across firms and its real effects during China’s economic stimulus plan of 2009-2010 using loan-level data from the 19 largest Chinese banks matched with firm-level data on manufacturing firms. We find that the stimulus-driven credit expansion significantly affected firm borrowing, investment, and employment. The plan disproportionately favored state-owned firms and firms with a lower marginal product of capital, reversing the process of capital reallocation that characterized China’s high growth before 2008. Against the backdrop of looming global recession, the Chinese government introduced a sweeping economic stimulus package towards the end of 2008, which included a fiscal plan and a set of expansionary policies on bank credit. The fiscal part of the plan featured an increase in government spending of 4 Trillion RMB (12.6 percent of the GDP in 2008) over two years, mostly involving infrastructure projects, social welfare programs, and the Wenchuang earthquake relief program. The central government directly financed 1.18 Trillion RMB. Local governments financed the rest primarily through local government financing vehicles (LGFVs), which are off-balance sheet companies set up to increase expenditure without officially running a deficit. The credit plan involved lowering the required reserve ratios of commercial banks and benchmark lending rates, among other expansionary policies. 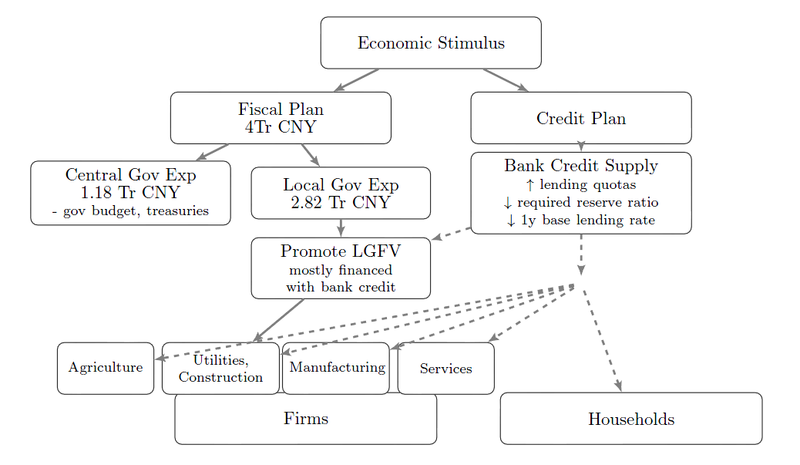 Although in part aimed at providing LGFVs with bank financing, the plan had a broad impact on the economy through drastically increasing credit supply directly to firms in all sectors, as well as households (see Figure 1). Despite being praised by international organizations and economists alike, there is scarce empirical evidence based on micro-data on the effectiveness of this program and on its potential unintended consequences in terms of the allocation of resources across firms (See Note 1). A recent wave of articles has studied the impact of the Chinese economic stimulus plan on real GDP growth (Ouyang and Peng 2015), aggregate output and employment (Wen and Wu 2014), interest rate liberalization (Wang et al. 2017), off-balance sheet spending by local governments (Bai et al. 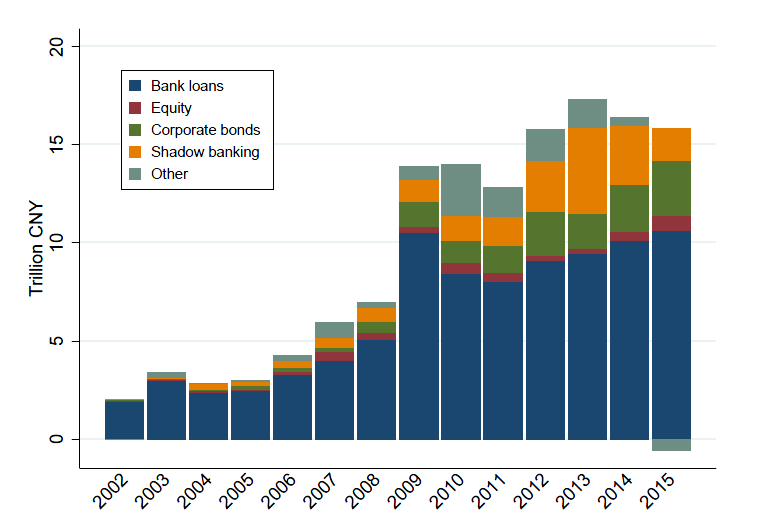 2016), the rise of shadow banking (Chen et al. 2017), and private firm investment (Huang et al. 2017). The literature thus far has largely focused on the fiscal part of the stimulus package, especially in relation to LGFVs. However, as shown in Figure 1 and emphasized by Premier Wen in his speech at Summer Davos in 2009, the concurrent credit expansion is an integral part of the stimulus package (See Note 2). In fact, the change in the aggregate balance of outstanding bank loans to the real economy doubled from 2008 to 2009, going from 5 to more than 10 Trillion CNY (Figure 2). The amount of new bank credit to firms and households is comparable in magnitude with that given to LGFVs. What are the consequences of such a large credit expansion on resource allocation across firms? How does the resulting credit allocation affect the real economy broadly? Notes: Source: Total Social Financing Dataset (TSF) of the People’s Bank of China. The category “shadow banking” includes loans by trust companies (trust loans) and entrusted firm-to-firm loans (entrusted loans). The category “other” includes bankers’ acceptances and credit operations categorized under “other" in the TSF data. In a recent paper (Cong et al. 2017), we tackle these questions and study the effect of the Chinese credit stimulus plan on financial and real firm-level outcomes. To this end, we use confidential loan-level data from the 19 largest Chinese banks collected by the China Banking Regulatory Commission, covering 80 percent of the banking sector’s corporate lending market.  Using unique firm identifiers, we match loan-level information with firm-level data from the Chinese Annual Industrial Survey, which covers both publicly-listed companies and private firms. The merged dataset contains information on both banking relationships and firm characteristics, such as employment, revenue, and ownership status. This allows us to study credit allocation across firms with different initial characteristics — such as connectedness to the government and productivity — during the stimulus years. Notes: Shaded areas indicate the stimulus program period (2008: Q4 to 2010: Q4). The solid lines show the mandatory RRR set by the Central Bank, while the dots show the average actual reserves as a fraction of bank deposits in each quarter observed in the data. Data on actual reserve ratios are from WIND and is aggregated by bank category. Banks are categorized by WIND into the following categories: state-owned, jointly-owned, and city commercial banks before 2010. Starting from 2010, these three categories have been re-labeled as, respectively: large, medium, and small banks, which is why we report them in different colors in the graphs. We match the WIND categories to the Central Bank categories of “large” and “medium and small” banks to which different RRR apply. For the joint-owned (then medium) banks, we report both RRRs as some of these entities are subject to the RRR for large banks. In the bottom right graph, we report the benchmark lending rate set by the Central Bank for loans with maturity between 6 months and 1 year. As a sanity check, we report in the same graph the interest rate of loans to Chinese publicly listed firms as officially announced in company statements. We observe in the data several interesting patterns. First, the increase in bank credit documented in Figure 2 is consistent with the measures introduced by the People’s Bank of China: lowering reserve ratios (RRR) for commercial banks and lowering benchmark lending rates for loans of various maturities. The first three panels in Figure 3 show the evolution of mandatory RRR between 2005 and 2013 separately for large, medium, and small banks, as banks of different sizes are subject to different RRRs. 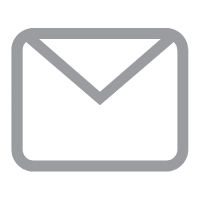 Benchmark rates are lower bounds on the interest rates that commercial banks are allowed to charge to their clients. These benchmark rates tend to be a binding-from-below constraint for commercial banks. For example, the lower right graph of Figure 3 shows that the Central Bank lowered the 6-month one year rate from 7.47 percent to 5.31percent. As shown, Chinese banks tend to keep reserves as a share of their deposits close to the ratio required by the People’s Bank of China and charge interest rates close to the binding constraints set by the benchmark rate. Notes: Source: China Banking Regulatory Commission. To produce this graph, we first sum across firms the monetary value of their outstanding loan balance at the end of each quarter. We then take a quarter-to-quarter difference of the sum. Moreover, banks tend to quickly respond to policy changes, resulting in liquidity and larger lending, which we observe both in the aggregate data (Figure 2) and in the loan-level data. Figure 4 reports quarterly changes in aggregate outstanding bank loans to Chinese firms, as well as its decomposition across sectors using the loan-level data. 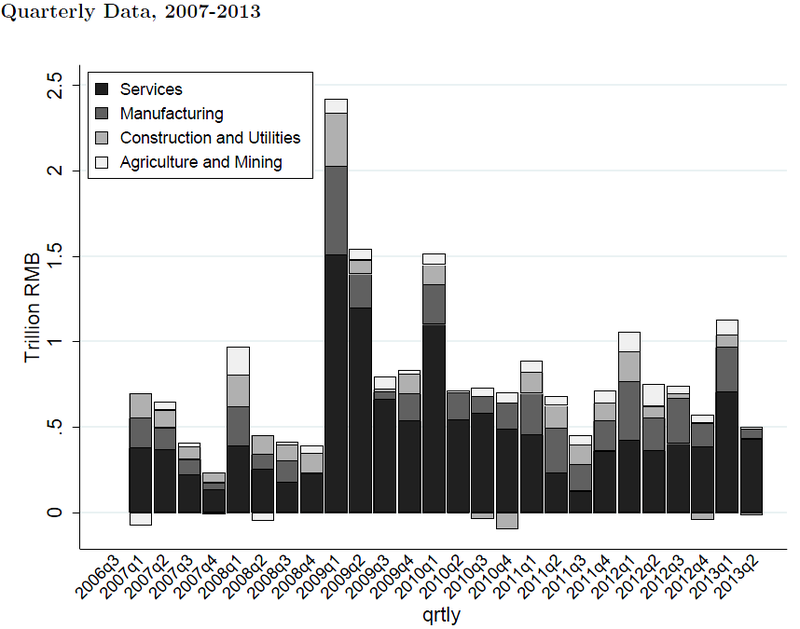 The figure shows that the credit expansion started in the first quarter of 2009 had a widespread impact on firms in all sectors, which is perhaps contrary to the public perception that the credit expansion primarily affected the construction and utilities sectors through LGFVs. Patterns from firm-level data are similar. The increase in bank lending observed during the stimulus years could be driven not just by credit supply forces, but also by the different demand or investment opportunities faced by firms. We therefore construct a measure of firm exposure to the credit supply increases, exploiting variations in banks’ responses to the stimulus policies and pre-existing firm–bank lending relationships. 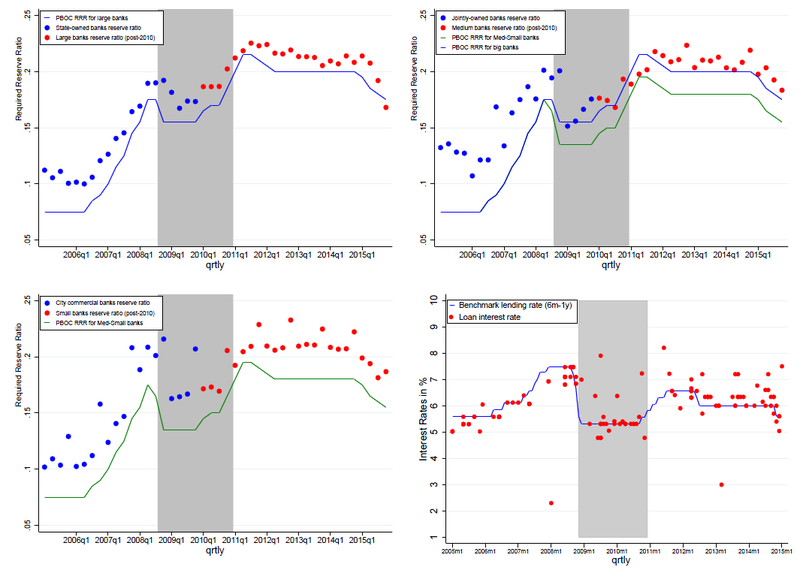 Using a methodology similar to Chodorow-Reich (2014), we define our measure of exposure to credit supply increases as the change in aggregate lending to other borrowers by a firm’s pre-stimulus lenders. We document that our measure of credit supply changes provides an effective explanation of the variation in firm borrowing. We also document that credit supply changes during the stimulus years had significant real effects. Firms with a 1 percent larger exposure to increases in credit supply experienced a 0.22 percent larger increase in investment and a 0.32 percent larger increase in employment during the stimulus years. We then study the heterogeneous effects of the stimulus and credit expansion across firms. We find that the effect of increases in credit supply on firm borrowing was 38 percent larger for state-owned firms relative to private firms during the stimulus years (to be contrasted with a 53 percent smaller borrowing rate in the pre-stimulus years). We also show that, over the same period, the effect of credit supply on firm borrowing was larger for firms with a lower pre-stimulus marginal productivity of capital, which is consistent with existing evidence that Chinese state-owned firms are, on average, less productive than private firms. When we extend our analysis to the pre-stimulus and post-stimulus periods, two important findings emerge. First, we find that in the pre-stimulus period, China was experiencing a gradual reallocation of capital from low-productivity SOEs to high productivity private firms. Second, the change in the trend of credit allocation between private and state-owned firms did not reverse back at the end of the stimulus years, indicating potential persistent effects of the stimulus policies. We then estimate the effect of the credit supply change on real firm-level outcomes. In theory, a preferential credit allocation to firms with low productivity and state-owned firms during the stimulus years might have helped to preserve political stability and boost aggregate investment. However, we find no evidence that state-owned firm investments responded to credit supply shocks more than their private counterparts during the stimulus years, invalidating the argument that allocating credits more to SOEs helped boost aggregate investment. Instead, we find that more productive firms tended to increase investments more with additional loans and yet were allocated less bank credits. That said, we do find that given the same new credit, SOEs were 1.76 times as effective as private firms in preserving employment. To rationalize these empirical findings and further understand the dynamics of credit allocation, we build on Song et al. (2011) to model a dynamic economy in which firms differ in both productivity and state-connectedness. Private firms are operated by skilled entrepreneurs, have higher productivity, and rely on both private investments and bank loans to grow. On the other hand, state-connected firms are neoclassical in that they maximize firm production using labor and capital and only borrow from banks. We explicitly account for recessions and stimulus and the implicit government bail-out of state-connected firms. During a recession, firms struggle to survive and differential access to external finance becomes more prominent; therefore, the efficient reallocation of capital from firms with low productivity to those firms with high productivity slows down and can potentially reverse. We also show that credit expansions amplify the reversal of prior trends in factoring reallocation. Figure 5 provides a simulation of the fraction of new credits that are allocated to SOEs before and after a recession and credit expansion using parameters close to those used in Song et al. (2011) and WB Doing Business. Before period 8 (each period is one year), credits were gradually allocated to the more productive private firms. Our empirical findings show that either a severe recession or big credit expansion can reverse the trend. The patterns for labor and total capital shares are similar. Notes: Findings are based on a simulation using parameters close to those used in Song et al. (2011) and WB Doing Business. 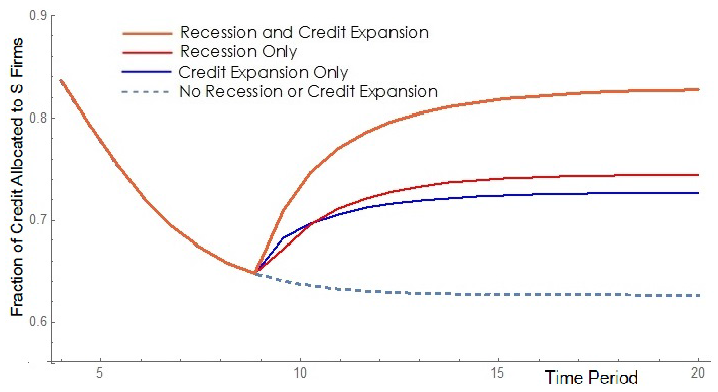 The figure illustrates the scenario in which recession and credit expansion occur at T=8 and are permanent. The four lines from top to bottom represent: 1) An economy with a credit expansion during a recession; 2) An economy in a recession; 3) An economy with a credit expansion only; and 4) An economy without a recession or credit expansion. While China-specific stylized facts certainly motivate the model assumptions, this mechanism applies more generally to and is informative of policy-driven credit expansions in economies characterized by preferential access to financing government-connected firms. Our model, in addition to explaining the empirical patterns in misallocation and reallocation dynamics in China, also illustrates a novel mechanism on how financial frictions impact the dynamics of misallocation across the business cycle and the credit cycle. Conventional wisdom follows the Schumpeterian notion that recessions ameliorate the underlying allocation of resources by cleansing weaker firms (e.g., Caballero and Hammour 1994; Cooper and Haltiwanger 1993; Mortensen and Pissarides 1994; and Ramey and Watson 1997). We show that recessions can actually increase misallocation based on measures of firm productivity. In summary, our paper provides the first evidence using loan-level data on the efficient reallocation of capital and labor from firms with low productivity to highly-productive firms in China before 2008, which is often cited as a key source of growth. Our research also provides micro-evidence that this process was reversed with the introduction of the stimulus plan at the end of 2008. While the stimulus policies may have helped preserve employment, they also increased misallocation by channeling more resources to less-productive government-connected firms and may have had a prolonged negative impact on the growth rate of aggregate productivity. The natural next step following these empirical findings is to better understand how financial frictions and misallocation jointly evolve in a dynamic economy and to quantify their impact on China’s growth and aggregate productivity. The episode in question also overlaps with continuous reforms and privatizations of banks and state-owned firms in China. We explore these topics in ongoing studies. Note 1: For example, in 2008, the IMF managing director, Dominique Strauss Kahn, and the World Bank president, Robert Zoellick, described China’s stimulus plan as a stabilizer for the world economy. Nobel laureate Paul Krugman praised the scale of the stimulus plans in South Korea and China when advocating for a larger stimulus in the United States. Bai, Chong-En, Chang-Tai Hsieh, and Michael Song (2016), “The Long Shadow of China’s Fiscal Expansion,” Brookings Papers on Economic Activity, Fall 2016. Caballerio, R. J., and M. L. Hammour (1994), “The Cleansing Effect of Recessions,” American Economic Review84(5): 1350-68. Chen, Zhuo, Zhiguo He, and Chun Liu (2017), “The Financing of Local Government in China: Stimulus Loan Wanes and Shadow Banking Waxes,” Working Paper, University of Chicago. Chodorow-Reich, G. (2014), “The Employment Effects of Credit Market Disruptions: Firm-level Evidence from the 2008-9 Financial Crisis,” Quarterly Journal of Economics 129(1): 1-59. Cong, Will, Haoyu Gao, Jacopo Ponticelli, and Xiaoguang Yang (2017), “Credit Allocation under Economic Stimulus: Evidence from China,” Working Paper, University of Chicago. Cooper, R., and J. Haltiwanger (1993), “The Aggregate Implications of Machine Replacement: Theory and Evidence,” American Economic Review 83(3): 360-82. Huang, Yi, Marco Pagano, and Ugo Panizza (2016), “Local Crowding Out in China,” SSRN: http://dx.doi.org/10.2139/ssrn.2820682. Mortensen, D. T., and C. A. Pissarides (1994), “Job Creation and Job Destruction in the Theory of Unemployment,” Review of Economic Studies 61(3): 397-415. Ouyang, Min, and Yulei Peng (2015), “The Treatment-effect Estimation: A Case Study of the 2008 Economic Stimulus Package of China,” Journal of Econometrics 188(2): 545-557. Ramey, Garey, and Joel Watson (1997), “Contractual Fragility, Job Destruction, and Business Cycles,” Quarterly Journal of Economics 112(3): 873-911. Song, Zheng, Kjetil Storesletten, and Fabrizio Zilibotti (2011), “Growing Like China,” American Economic Review101(1): 196-233. Wang, Hao, Honglin Wang, Lisheng Wang, and Hao Zhou (2016), “Shadow Banking: China’s Dual-track Interest Rate Liberalization,” Working Paper, Tsinghua University. Wen, Yi, and Jing Wu (2014), “Withstanding Great Recession Like China,” Working Paper 2014-007A, the Federal Reserve Bank of St. Louis.